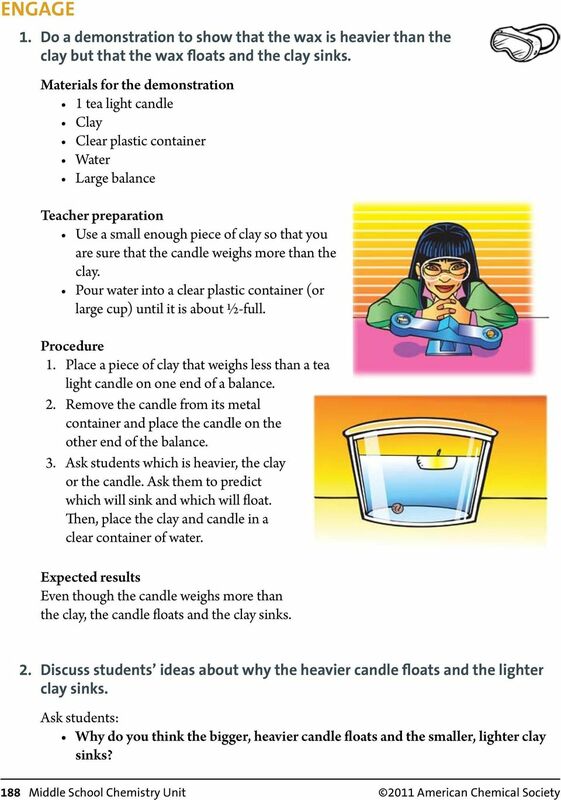 Download "Chapter 3, Lesson 4: Density: Sink and Float for Solids"
Chapter 5, Lesson 3 Why Does Water Dissolve Salt? Multiple Choice For questions 1-10, circle only one answer. Density. Density is how concentrated or compact matter is. Buoyancy. What floats your boat? Timing This activity takes minutes to complete. Hot Leaks. See how the temperature of liquids changes the way they flow. P h y s i c s Q u e s t A c t i v i t i e s Activity 2 1 Hot Leaks See how the temperature of liquids changes the way they flow. Safety: This experiment requires using the hot water tap and straight pins. Fluids I. Level : Conceptual Physics/Physics I. Q1) Order the following materials from lowest to greatest according to their densities. 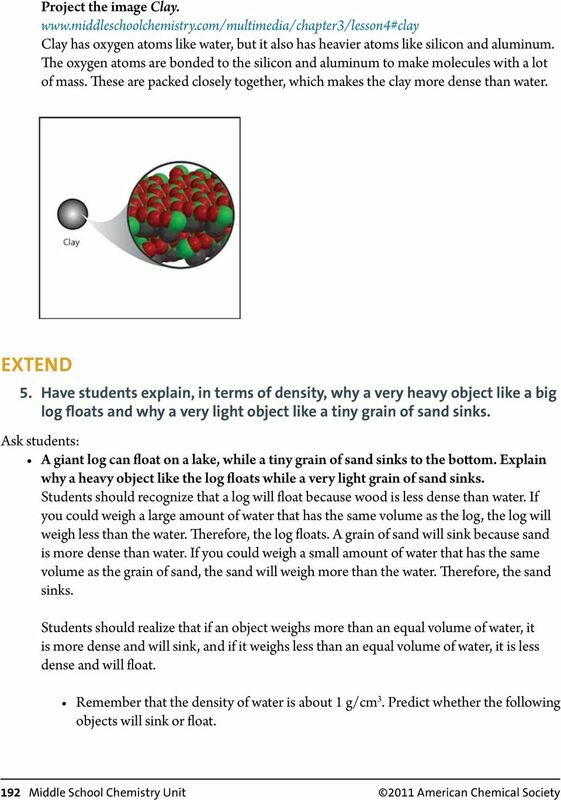 Fluids I Level : Conceptual Physics/Physics I Teacher : Kim 1. Density One of the properties of any substances (solids, liquids and gases) is the measure of how tightly the material is packed together. Name: Class: Date: ID: A Chapter 2 Assessment Multiple Choice Identify the choice that best completes the statement or answers the question. Complete short answer questions on a separate sheet of paper. Classifying Matter. reflect. look out! Chapter 4, Lesson 5: Energy Levels, Electrons, and Ionic Bonding Key Concepts The attractions between the protons and electrons of atoms can cause an electron to move completely from one atom to the other. 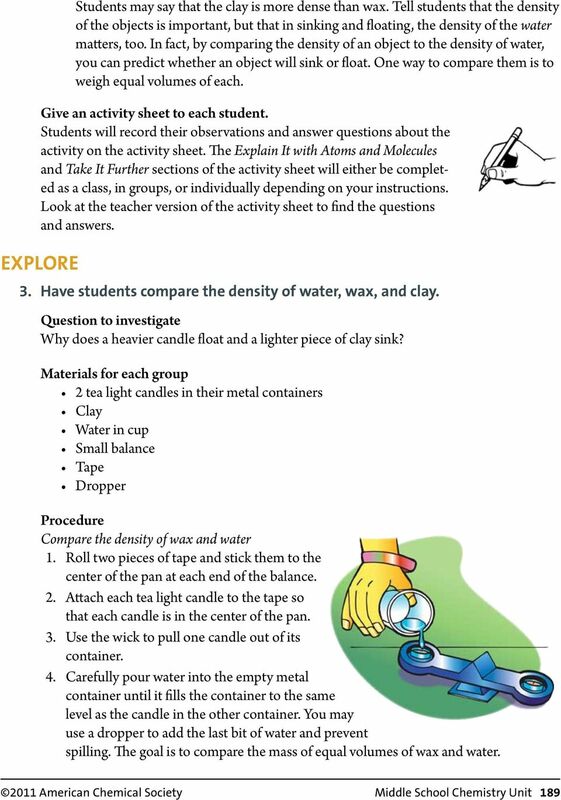 Grade 5 Standard 1 Unit Test A Matter. Multiple Choice. MSCOPE Final Project Report Melanie Hopkins, Mary Leighton, Roscoe Nicholson, and Panos Oikonomou. Sink or Swim. Photo: M.
Sample Questions in multiple choice format. 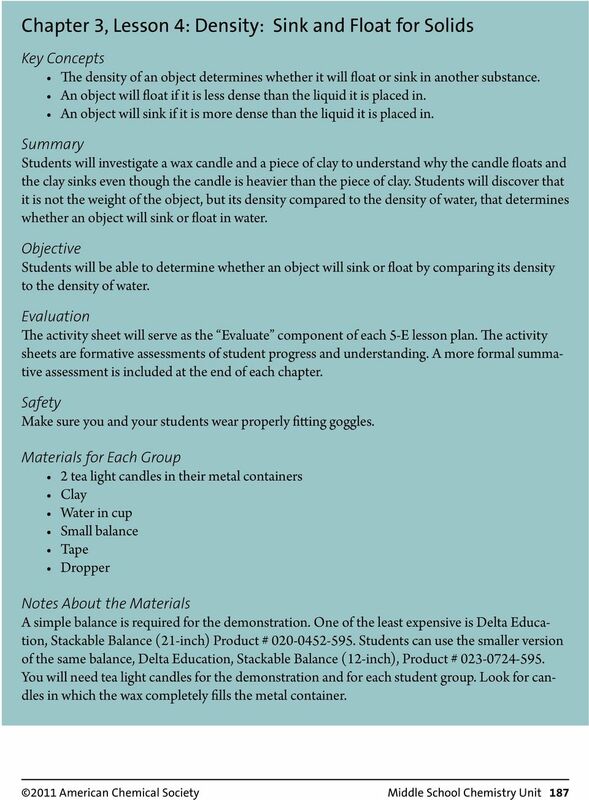 Teacher s Guide Grade Level: 6 8 Curriculum Focus: Physical Science Lesson Duration: Two class periods Program Oxygen and Atoms Explore atomic and molecular structure and see how oxygen was first isolated. Mixtures. reflect. How is seawater different from pure water? How is it different from rocky soil? magnetic compass on human society, exploration, and maritime history and the natural forces that make the magnetic compass work. Chemical Calculations: The Mole Concept and Chemical Formulas. AW Atomic weight (mass of the atom of an element) was determined by relative weights. 1 Introduction to Chemistry Atomic Weights (Definitions) Chemical Calculations: The Mole Concept and Chemical Formulas AW Atomic weight (mass of the atom of an element) was determined by relative weights. 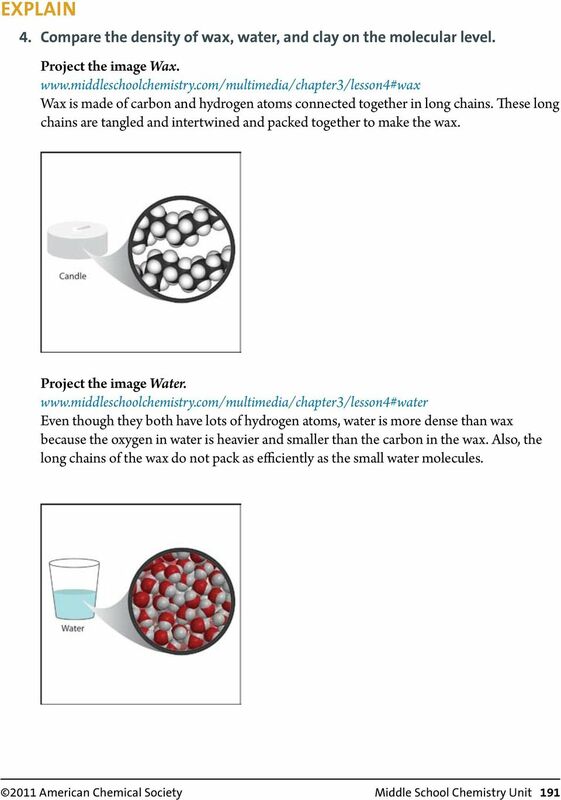 Chapter 5 Student Reading THE POLARITY OF THE WATER MOLECULE Wonderful water Water is an amazing substance. We drink it, cook and wash with it, swim and play in it, and use it for lots of other purposes. 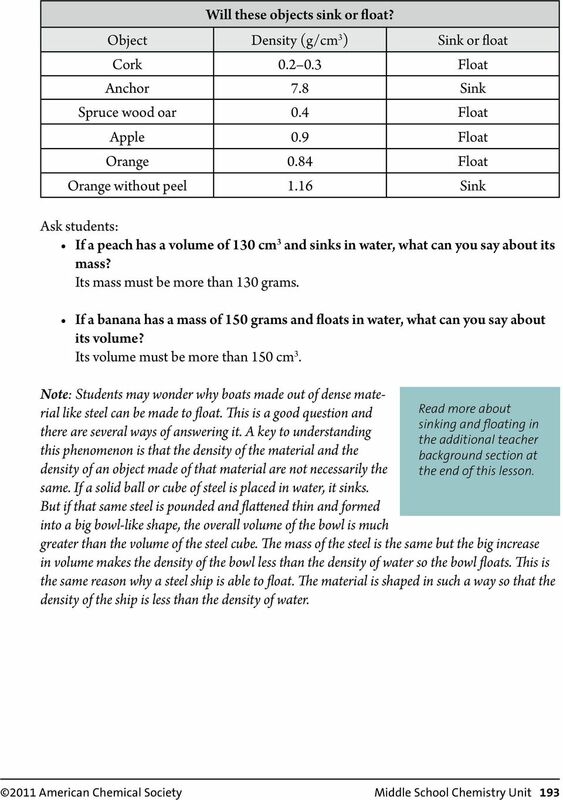 Buoyancy and Archimedes Principle. Buoyancy and Archimedes Principle Assume block is in equilibrium. Activity: How Do We Clean Up an Oil Spill? 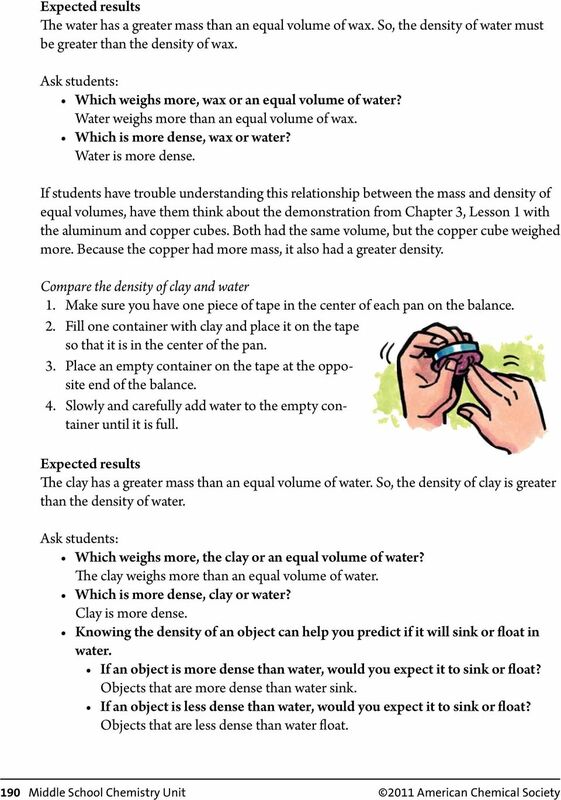 Assessment Chapter Test B Chapter: Measurements and Calculations PART I In the space provided, write the letter of the term or phrase that best completes each statement or best answers each question. 1. 1. Multimedia presentation (PowerPoint or video) 2. 1. Make a prediction of how many drops of water will fit on the dime before it spills over the edge.